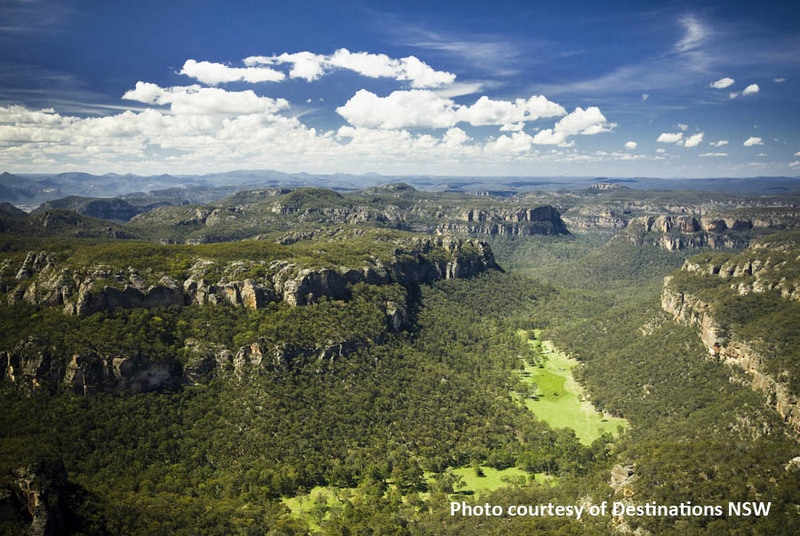 To the west of the Blue Mountains lies the magnificent Wolgan Valley. One of this region’s best kept secrets, this amazing area has scenery to rival its neighbouring region of the Blue Mountains but is relatively unknown. This of course is changing, international company Emirates recently invested millions of dollars in an exclusive resort in the valley aware of the drawcard of its stunning beauty. As word spreads this region will see an influx of visitors. Wolgan Valley is a stunning region of dramatic escarpments, beehive pagoda rock formations, rich bushland and ancient aboriginal rock paintings. It is also home to an extensive flora and a wide array of native wildlife. 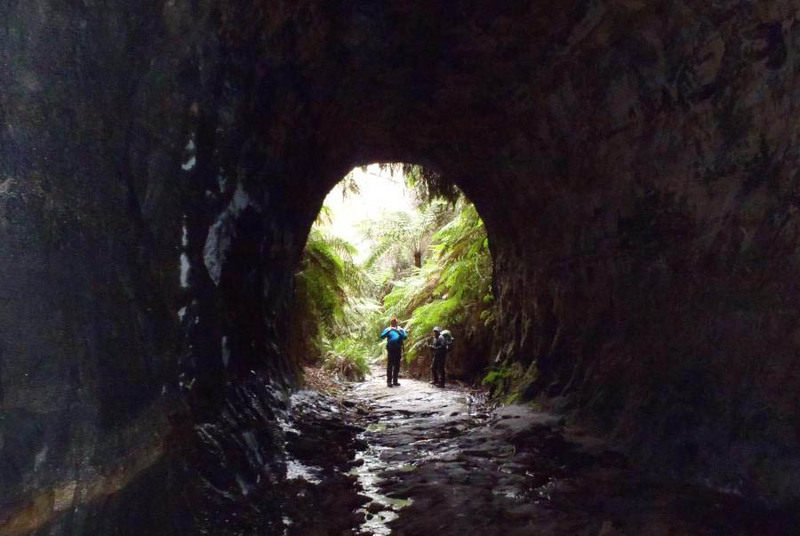 On this 2 day guided Wolgan Valley walk you will travel through a tunnel filled with thousands of glow worms, see spectacular views as you descend from the cliff tops into the beautiful Wolgan Valley and see the historic town of Newnes. During the tour we spend 1 night at the charming handcrafted Newnes Cabins. Set amongst the wilderness of Wollemi National Park with its canyons and sandstone cliffs, and close to the old ruins of the former shale oil mining town, this is a place you can escape from the rest of the world and technology. In the evenings our guides will cook up a delicious meal for you to enjoy featuring local produce. All dinners include fine regional wine to enjoy with your meal. Fine wine and non-alcoholic drinks served with dinner. Please note: we advise drinking in moderation as walking can be strenuous. If you would like to enjoy alcohol after dinner you will need to provide your own. Day 1 of our adventures sees us meeting at Carrington Hotel, Katoomba at 8.30am, for our transfer to the start of the walk. We arrive at Wollemi National Park, driving through a series of rock tunnels which seemingly transport us into another world. Our guide explains the route ahead, before we set out through a landscape of tall eucalypt forest with Blue Mountains Ash, spectacular pagoda rock formations, vibrant ferns, canyons and streams. 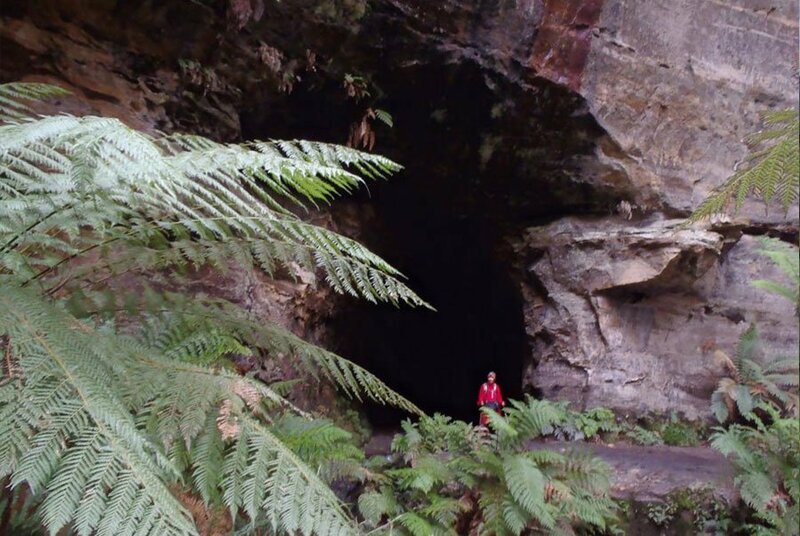 We arrive at the entrance to a cave like tunnel, from here we walk under the mountain range, taking a fascinating short cut to the Wolgan Valley and the beautiful Gardens of Stone National Park. We descend into the darkness with our trusty torch in hand, stopping halfway to turn off our torches and be amazed by the thousands of Glow Worms which transform the tunnel into a starry night. Though natural looking from its exterior appearance, this tunnel is actually a disused railway line, which once descended into the Newnes valley, transporting oil shale. We emerge on the far side of the tunnel greeted by a grove of tree ferns and sheer vertical cliffs towering over 600 feet high. 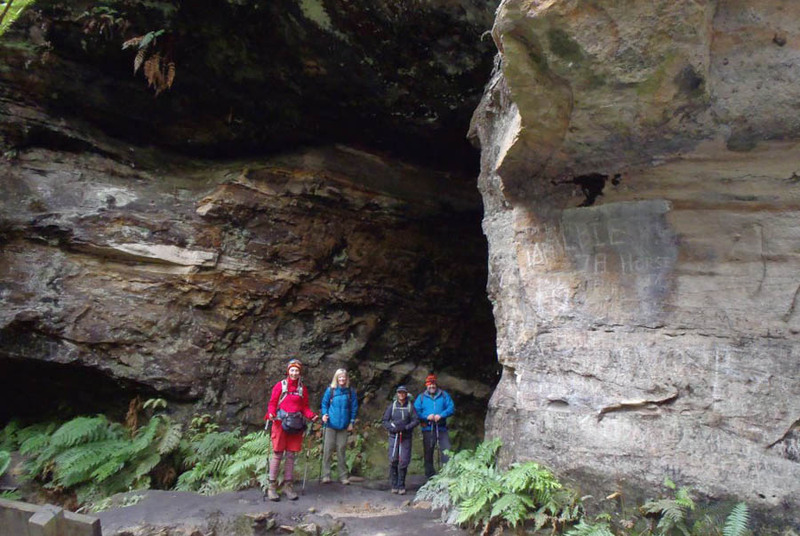 We explore beautiful Bells Grotto surrounded by a stunning treefern forest . Continuing on we admire the sandstone cliffs cut high on either side of the gully and we begin to see glimpses of the dramatic scenery of the Wolgan Valley and river below. We follow the track along pretty Wolgan Valley creek admiring the rock pools along the way down into the historic Newnes region where we spend the night. Enjoy accommodation in cabin set amongst bushland in the valley. Cabins have lounge, dining rooms and large verandahs for taking in the beautiful mountain and bus views. Tonight sit back and relax and talk about the days adventures as your guides prepare a delicious dinner featuring local produce. Today, after a hearty breakfast, we take the historic Pipeline Track to the top of Pipeline Pass, where a lookout on the towering cliffs provides a majestic view over the wild Wolgan Valley and a great place for a well-deserved morning tea break. The steep and rugged track follows the route of an old oil pipeline that once ran between the shale mining communities of Glen Davis in the Capertee Valley and Newnes in the Wolgan Valley. Remnants of the pipeline can still be seen along the way. 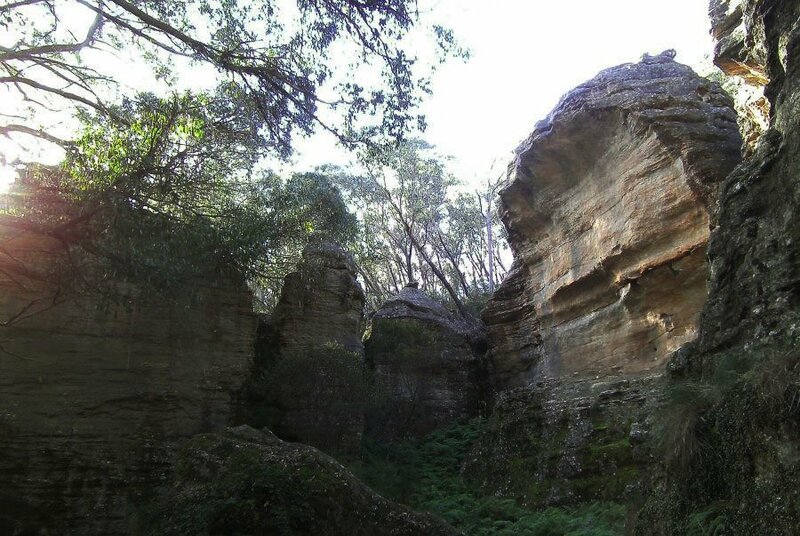 The first few kilometres of the walk meander beside the beautiful Wolgan River past some of the other industrial ruins of Newnes, but the final kilometre to the lookout climbs more than 300 metres from the valley floor to the top of the sandstone escarpment. On the way up and down this very steep section of track it is at times necessary to scramble with hands and feet. We return in time for lunch back in Newnes. Our 4WD vehicle then escorts us back to Katoomba. We had a small group of 6 plus our guide and it was a barrel of laughs and friendly banter the whole way. Our first stop was the glow worm tunnels where we walked to the middle of the tunnel and extinguished our torches before the tunnel transformed into a starry wonderland. We emerged from the tunnel and entered into a gulley of tree ferns surrounded by gorgeous rock walls with a creek trickling beside us. The views to Donkey Mountain were spectacular as we perched on the cliff edge and regrouped. The whole trip was very easy going and relaxed never feeling rushed to get anywhere. Guides were knowledgeable and friendly, scenery was gorgeous, walk was relaxing, food was gastronomically divine and the overall experience was second to none. Highly recommended!! 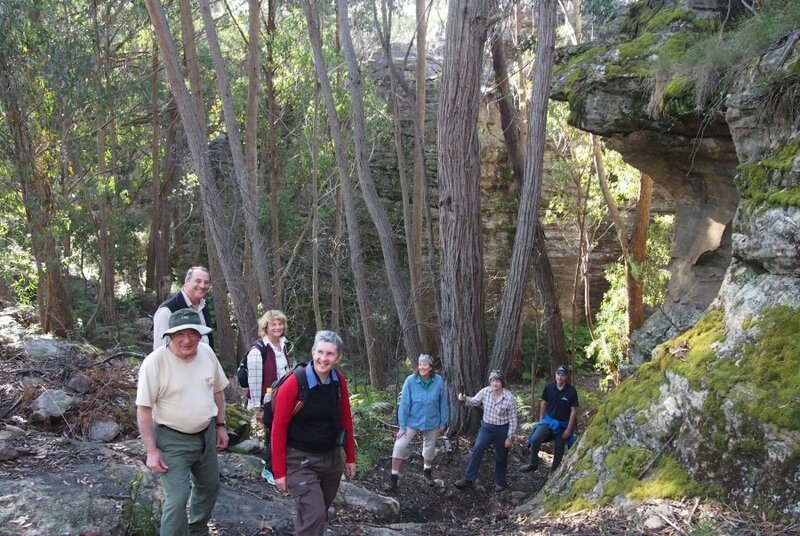 Your walking tour includes one night accommodation in cabins at Newnes. Cabins have a living area, bathrooms and large kitchen. We will stay in a variety of cabins the largest of the cabins has three bedrooms. Bedrooms have Queen size beds. Sit back and relax on the beautiful verandahs taking in spectacular mountain and bush views. We have the following departures available. Spots specials available on this tour. Spot specials save $150 per person when you book and pay in full at time of booking. See availability tab for specific dates. See special cancellation policy for earlybirds below. Departure of your choice. Available for groups of 8 – 10 people. Book & Pay in full at time of booking. Due to limited accommodation on this walk, single supplements are not available. Solo travellers will be required to share with other single travellers of the same gender.